The first book featured for the new year, 2014, is none other than the brilliantly-written, The World Peace Diet: Eating for Spiritual Health and Social Harmony by Amazon best-selling author, Will Tuttle. This book explains thoroughly why a vegan diet is the only diet of choice for all people from various perspectives – spiritual, political, ecological, nutritional and cultural. Tuttle profoundly makes the connection between our culture, our food, and our broad range of problems. He explains and demonstrates the way to a positive transformation in the individual and the collective. If you are seeking a new perspective on how to solve the dilemmas we face as a growing population and changing culture, this book is for you! Born in Emerson Hospital in 1953 in Concord, Massachusetts, and a thirty-plus year vegan, Dr. Will Tuttle is a pianist, composer, educator, and the recipient of the Courage of Conscience Award. As a former Zen monk, his Ph.D. from U.C. Berkeley focused on educating intuition and altruism. He presents ongoing events promoting peace through compassion for all life via articles, lectures, radio, TV, and print interviews, trainings and online seminars. He lives and travels around the country with his wife, Madeleine, in their motor home. As a vegan and as lover of great reads, I am facilitating a study of this marvelous book! Join me, Vilma Reynoso, Vegan Wellness Coach and Peter B. Roth, Transformational Spiritual Healer, Astrologer and vegan, for a study and discussion of The World Peace Diet: Eating for Spiritual Health and Social Harmony. Our purpose is to dig deep into the reasons why people choose to become vegan and the reasons why it is vital to adopt the vegan lifestyle. You are welcome to join whether you are a seasoned vegan, a new vegan or curious about veganism, and if you live in the Denver metro area. Meetings will be held in Denver, CO, on the last Thursday of the month in January, February, March, and April of 2014. Each meeting will consist of a short presentation and recap of the month’s assigned chapters. An open discussion will then follow. To join this study, visit The World Peace Diet Meetup. To learn more about Will Tuttle or to purchase a printed version of The World Peace Diet: Eating for Spiritual Health and Social Harmony, visit Will Tuttle’s website. Vilma Reynoso, www.vilmareynoso.com. Inspiration for Creative Health. Abundant Life. Categories: Book Reviews, Green Living, Spirituality, Veganism | Tags: Culture, Denver Book Study, Ecology, Green Living, Health, Peace, Peace Diet, Peter B Roth, Politics, The World Peace Diet, vegan health, Vegan Nutrition, Veganism, Vilma Reynoso, Will Tuttle, World Peace | Permalink. Vegan Green Smoothies by Vilms: 35 Easy, Nutritious and Delicious Recipes for Ultimate Health and Vitality is a short, concise and informational e-Book outlining the health benefits of green smoothies. The book includes my easy recipes that you will love! If you are curious about green smoothies, looking to improve your health or eating habits, are a seasoned vegan or raw vegan, these recipes will entice your palate! As a child, I grew up consuming my father’s Argentine barbecues every Sunday. Usually ill with colds as a child, I suffered from chronic sinus problems, asthma and respiratory ailments, and was overweight. As a young adult, I suffered with horrible PMS, fibroids, chronic fatigue, anxiety, mood swings, asthma, intestinal problems, sinusitis, foggy thinking, and even depression. After evaluating my health and the deaths of both my parents due to heart disease, I became motivated to change my life, one step at a time. I slowly began to change my diet from meat-based to vegetarian, then to vegan, and finally to a mostly raw vegan diet. Healed from most of my ailments, I have never looked back! Vegan Green Smoothies by Vilms: 35 Easy, Nutritious and Delicious Recipes for Ultimate Health and Vitality is one of several upcoming e-books. I have written it to demonstrate to you, the reader, how taking a small step, such as incorporating green smoothies into your daily routine, can dramatically enhance your life and health. To learn more about me or the vegan lifestyle, please visit my other website, vegoutwithvilms.com. 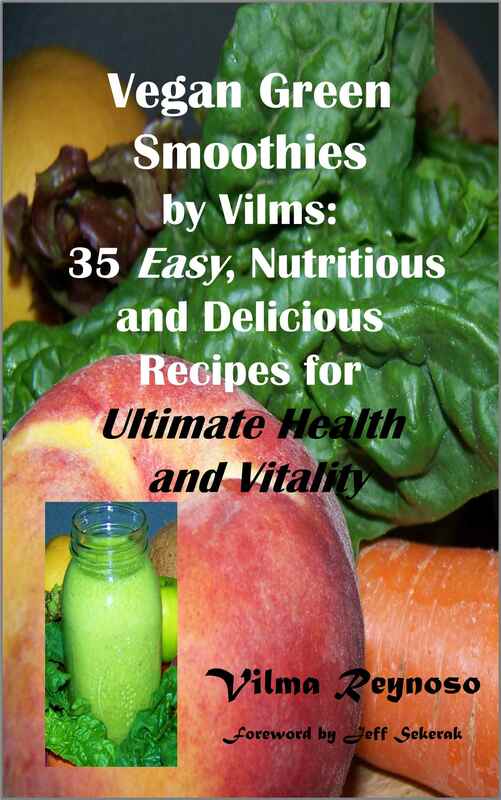 Vegan Green Smoothies by Vilms: 35 Easy, Nutritious and Delicious Recipes for Ultimate Health and Vitality by Vilma Reynoso is available for purchase in the following formats for only $2.99! Categories: Book Reviews, Health, Inspiration, Veganism | Tags: Green Living, Green Smoothies, Healthy Vegan Smoothies, raw vegan health, raw vegan recipes, raw vegan smoothies, raw veganism, Smoothie Recipes, Smoothies, VEG out with Vilms, vegan health, Vegan Health and Lifestyle, vegan smoothie recipes, Veganism, Vilma Reynoso | Permalink. For those who appreciate and savor living an abundant life incorporating exercise and nutritious food to nourish the body and mind, look no further for a great read! Confessions of a Super-Fit Vegan, or: ‘I ate the food of the gods, loaded up on carbs, forgot to count calories and built the body of my dreams. You can too!’ by Jeff Sekerak is a wealth of information that will motivate you to get off the couch and change your life for the better or improve your existing routine. Jeff Sekerak is an inspiration who walks his talk! Jeff Sekerak’s e-book, available on Amazon in kindle version, will show you how to load up on carbs and lose all the weight you want, how to use supplements for superior health, and how to become lean and sculpt a muscular body in thirty days or less with his personal, proven-to-work exercises, and more! Jeff Sekerak is a former Alaskan commercial fisherman and fast-food addict turned “Super-Fit Vegan” and is committed to a high raw vegan diet and body-weight exercise. Jeff also operates the website, thesuperfitvegan.com, records useful workout tips and strategies on the YouTube channel youtube.com/jeffsekerak, and writes the blog, superiorbodyhealth.com/blog. To purchase a copy of Confessions of a Super-Fit Vegan, or: ‘I ate the food of the gods, loaded up on carbs, forgot to count calories and built the body of my dreams. You can too!’ by Jeff Sekerak, visit his website at www.thesuperfitvegan.com or purchase a copy from Amazon. Categories: Book Reviews, Health, Inspiration, Veganism | Tags: Exercise, Jeff Sekerak, Raw Vegan Health and Fitness, Super Fit Vegan, Superior Health and Fitness, vegan health, Vegan Health and Fitness, Vilma Reynoso | Permalink. Thanksgiving is a reflective and special time for me. It will always be because there was a time when I was not so thankful for my life. 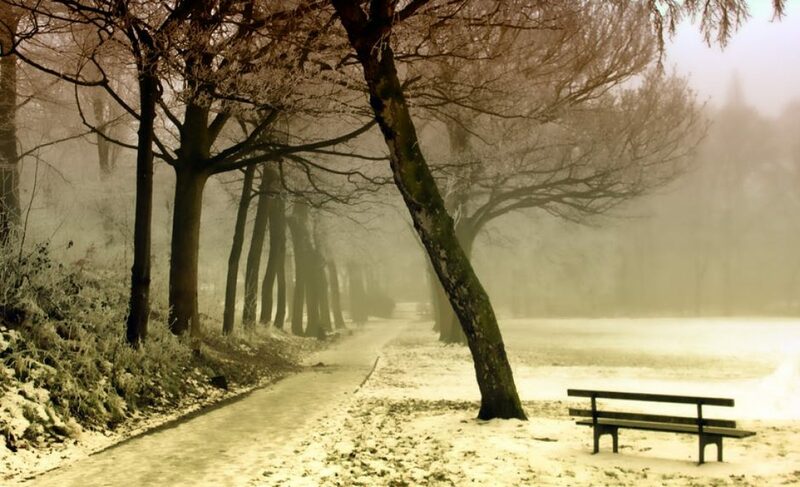 Years ago, during one Thanksgiving season, I left an abusive relationship. It was one of the most courageous steps I had to take to save myself, my spirit, my sanity. It had to be done, and there was no looking back. To say that I am now a different person today is an understatement! As the years passed by, I gradually let go of my fear and learned how exciting life is and how beautiful I am as a person. I am still on a journey, as we all are, but I can say with assurance that I am a NEW creation, with a new outlook, a new attitude, a renewed mind and definitely a new spirit! I will never be made to feel afraid again. I will never be made to feel “caged” again. I will never be treated again like I was “back then.” I will never experience that again because I now know that what I think about and who I am attracts what comes into my life. I have learned a lot from that terrible and enduring experience. I now remember it fondly but without the pain. I can now share it and not relive it. I am blessed. I am thankful. Have you ever felt caged? Have you ever been in fear for your life? Did you ever feel like you truly had lost your mind, or have you ever felt so confused and numb from all the pain? I have been there. I now live to put an end to this type of torture and prison that many of us live in. There is not a day that passes by that I am not thankful for who I am, what I experienced and where I am today. However, every holiday season, I cannot help think about other living beings that are caged, in fear, in emotional confinement, and in physical torture, too. And, on Thanksgiving, it is the turkeys that are caged and murdered to celebrate a time of “thanks.” Over forty million turkeys are slaughtered for this holiday. How hypocritical we are as human beings. How can we celebrate a time of peace, travel far to get together with our family and friends, and center our celebration around food and sit down and consume, with fervor, the remnants of an abused and murdered animal? It really does not make any sense. As a matter of fact, when you truly think about it, eating a turkey (or any animal) and giving thanks when it is not necessary for our survival is a senseless act. There will never be “peace on earth” or peace in our hearts and minds, if we continue to torture, abuse, murder, and eat animals. What we put into your bodies, our minds and hearts becomes a part of us. A person who consumes violence condones violence. If one partakes in the traditional Thanksgiving by eating a dead turkey, he participates in violence; he participates in abuse. He condones abuse. It is logical. Vegan turkey: a vegan alternative to turkey that comes already made with stuffing and gravy. For some recipes and other alternatives, click below. Let’s stop the abuse this Thanksgiving season and have true peace, for all. Categories: Abuse & Oppression, Animal Rights, Holidays, Veganism | Tags: Abuse & Oppression, Abusive Relationships, Holidays, life coaching, VEG out with Vilms, Vegan Alternative Thanksgiving, Vegan Food, vegan health, Vegan Thanksgiving, Vilma Reynoso | Permalink.